Our cattery is located in SE Oklahoma and owned by Crystal and Mike Lowe. Our passion is with the magnificent Savannah breed, therefore, we are an exclusively Savannah cattery, dedicated to producing the highest quality, Breed Standard, Savannahs with the exotic appearance of the African Serval, while keeping health and happiness first and foremost. 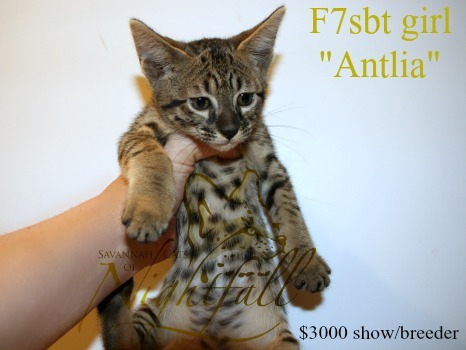 Breeding Savannah cats and breeding high quality Savannah cats are two completely different things. Our fur babies are raised in our very busy home, with our 4 children. The very first F1 Savannah kitten was produced by Judee Frank, accidentally, by housing an African Serval and a Siamese cat together in 1986. That F1 kitten, (named Savannah) was owned by Suzi Mutascio, as it was her serval who bred the Siamese cat. That kitten grew up and went on to produce kittens of her own in 1989. Lori Buchko now owned Savannah and she produced another litter of kittens. 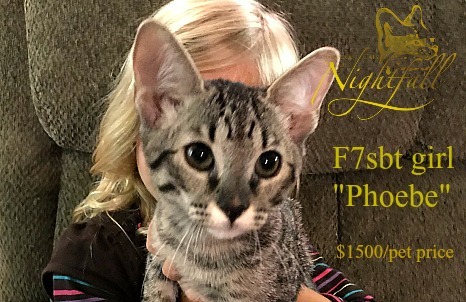 Patrick Kelley came to own the F2 and her F3 kitten, produced by the very first F1 Savannah, and fell head over heels for this amazing new breed of cats. 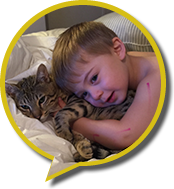 In 1991, he created the first savannah breeding group, savannahcat.com. Patrick could not own a Serval in the state he resided in, but that didn’t stop him from finding someone who could. He eventually found Joyce Scroufe, who bred Servals along with other exotic cats, and after much convincing, she agreed to try to produce another F1 Savannah cat, at Patrick’s request. In 1994, another F1 was produced, while Patrick remained behind the scenes promoting this magnificent new breed. Joyce Scroufe and Patrick Kelley are known as the founders of the breed and Patrick’s determination and vision was crucial for the Savannah breed as we know it today. It was a long and hard road to get this new breed accepted by TICA, and many people worked long and hard to get this accomplished. 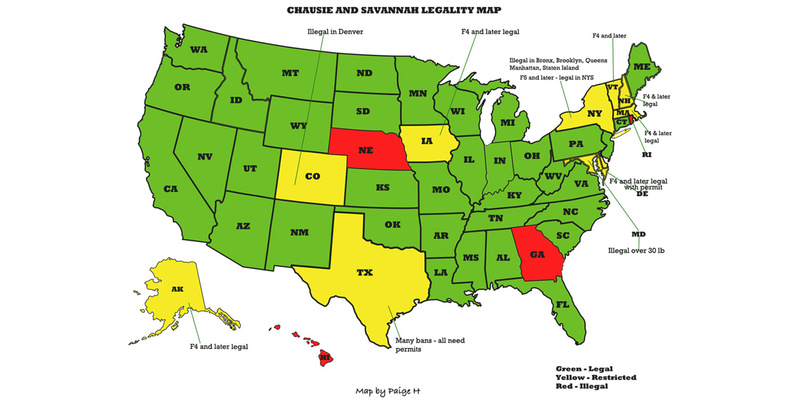 In 2001, the breed got registration status but it wasn’t until 2012 that the Savannah cat gained championship status. 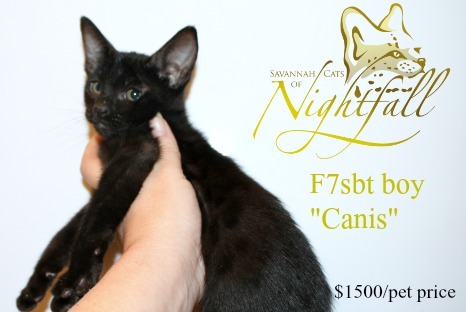 Our experience with Savannah Cats of Nightfall has been nothing short of amazing! They are extremely responsive and take the time to get to know you to help you select the right cat for your family. Every step of the way, communication was clear and thorough. We welcomed a black F6 into our family and he has been fantastic. It is easy to see there was a tremendous amount of time and love poured into the care and socialization of our kitten. And the support didn’t stop at pick-up. They have remained open to providing tips and recommendations for transitioning into a new home. Be sure to follow their advice… our kitten is so affectionate with everyone in the family and is wonderfully playful and cuddly with our dogs too. Truly the best new pet experience I have ever had! Baloo is our beautiful F2 male. Myself and my family feel so blessed that he has come to live with us and bring us so much joy. He was 24 weeks old when he came to us and he is now almost a year old now and has grown so much he weighs in at 11lbs 4oz and is long and lean and getting tall. He likes to steal chicken or red meat off the counters by just reaching up grabbing it and running off to... eat his "kill" as we call it cuz he's constantly hunting. He can run and jump so high to where he can clear the couch when chasing Jasper our other cat. Our children love him and he loves them so much. It not uncommon for him to crawl under the blankets to sleep with the children or us. We are so happy that we were referred to Crystal About Baloo, she was so helpful and patiently waited for us to get back from vacation before we could have Baloo come to our home. Myself and my family thank you and we can't picture our family without Baloo he is truly a special cat. 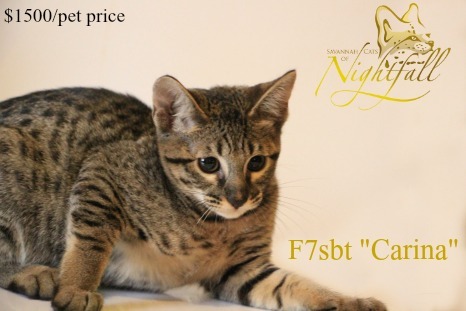 I got an F2 Female from Savannah Cats of Nightfall. Crystal was amazing to work with from day one. She was quick to responded to each of my questions, took extra steps to make sure each one of her babies goes to the best home. Loretta (AKA Ziva) has an amazing personality that fits our home perfectly. She is well socialized and marking are beautiful. 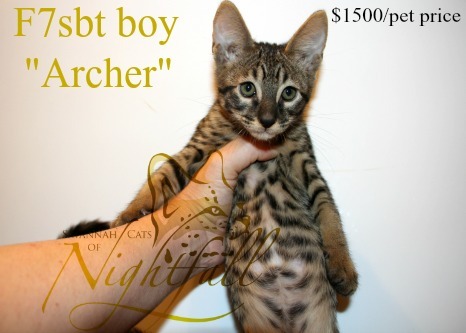 Highly recommend Savannah Cats of Nightfall for your next member of your family, you won't be disappointed. Thank you for such an amazing girl!